I knew very little about the murders committed by Scottish serial killer, Peter Manuel, who was hanged for some of his crimes in 1958, and while I tend to avoid fiction written about real people, Denise Mina’s The Long Drop sounded intriguing. The Long Drop is both a reconstruction and a re-imaging of the case. The book opens in December 1957 with a businessman named William Watt who attends a meeting with career criminal Peter Manuel. The meeting has been brokered by celebrity lawyer Laurence Dowdall who, on the way to the meeting, gives Watt, his client, various pieces of advice about how to handle Manuel. This advice is needed as Peter Manuel is a slippery customer, manipulative, cunning and extremely dangerous. Dowdall, trying to hang onto professional integrity leaves Watt and Manuel alone. But why are Manuel and Watt meeting? For those (like me) who know very little about Manuel’s bloody, violent career, he was accused of, convicted and hanged for (as the book’s title suggests) murder. Watt’s wife, sister-in-law and daughter were three of the victims. They were shot in the Watt home, and initially Watt was the main suspect. The meeting between Manuel and Watt, brokered by Watt’s lawyer, is ostensibly for Watt to ascertain specific, secret information Manuel has regarding the murders. The meeting morphs into a nightlong pub crawl with Manuel and Watt hitting many dingy, dank pubs of Glasgow. At this point, I put the book down. Could this have really happened? If you suspected that a man murdered your wife, daughter and sister-in-law, could you spend a whole night with him, buying him drinks? Truth is stranger than fiction. In the case of the Speed Freak Killers, for example, a large sum of money was promised to the killers in exchange of information about buried bodies. It’s possible that if you were desperate for information, you could put your personal feelings aside and make a pact with the devil. Possible if you had great personal restraint. And William Watt was a desperate man. Although he was on holiday the night his family members were murdered, he’d taken the family’s dog, his wife’s dog with him–something he’d never done before, and eyewitnesses (who were later discredited) placed him on the road traveling back to Glasgow in the wee hours. Plus Watt had a mistress and his wife was an invalid. There was a lot at stake for Watt who was initially arrested but later released without charge. The coal smog is heavy and damp here, it swirls at ankle height. This dank world is peopled with tramps and whores from Glasgow Green and clapped out street fighters. A burning brazier lights men with fight-flattened noses slumped against a crumbling black wall. Manuel is a sly, cunning psychopath and we see the various sides of the man. There’s the Manuel he’d like to be: a writer, a man about town, the man who’s courteous with women, but then there’s the sexually frustrated, violent son who intimidates his mother, and then there’s the charmer who tries to project his charisma and intelligence to the unbelieving jury. Manuel is a fantasist, a psychopath whose narcissism leads him to fire his defense counsel and conduct his own defense. We see Manuel’s staggering misreadings in the courtroom–evidence of his stunted emotional projection. Peter Manuel does not know how other people feel. He has never known that. He can guess. He can read a face and see signs that tell him if someone is frightened or laughing. But there is no reciprocation. He feels no small echo of what his listener is feeling. There’s a reimagining here–a fiction element of the novel which I cannot address fully without spoilers. I understand why the author became so obsessed with this case, and why The Long Drop was created. For this reader, Denise Mina offered a possible explanation in a fill-in-the-blank way. As a work of fiction, it’s an excellent read, but while the author’s version is plausible, there’s an ethical position to this imagining. Those involved cannot challenge the book. I follow the reviews written by fellow crime addict reader Cleo, and she also reviewed Denise Mina’s book, The Long Drop favourably. I had demonstrated that it was for the text to ‘write’ its author rather than vice versa, the presence of a human sensibility somehow embedded with that language, within that text, had at last been understood for what it truly was: an absence, a void. The old and handy pedagogical dichotomies, the so-called binary oppositions that had once served to authenticate the truth and completeness of the Author’s interior universe–identity and difference, nature and culture, self and society–had at last been reversed or dissolved. The book opens with Sfax meeting Astrid, a “flickeringly brilliant if too conventionally focused” former graduate student, who tells him she plans to write his biography. Sfax, our first person narrator, is obviously not thrilled by the proposition and tells her that he will cooperate but that she will not ‘get’ him–that no one ever has. Perhaps that reaction isn’t too surprising from a critical theorist, or is there something else afoot? Something far more sinister? How much of Sfax, paradoxically, lies in his theory? I proposed that, again, in every text, there would fatally arrive what I called an aporia, a terminal impasse, a blank brick wall of impenetrability, an ultimatum of indetermination, when its self-contradictory meanings could no longer be permitted to coexist in harmony and its fundamental ‘undecidability’ would undermine for ever the reader’s most fundamental suppositions. That’s as much of the plot as I’m going to discuss of this slim novel of 135 pages, but I will say that if you enjoy novels about campus life and academic skullduggery, you should try this novel. Obviously Gilbert Adair has fun here (referencing Barthes) with this tale of university competitiveness, backstabbing academics and the unassailable qualities of dominant theories that hold academic disciplines in thrall. Even Giles De’Ath from Love and Death on Long Island is mentioned here in a passing reference to being an advocate of the Theory. a kind of Peter Pan in reverse, never known to have been young. Indeed, his mousy nicotine-stained moustache and frankly sepia beard impressed one as older even than he was, deeply unappetizing hand-me-downs from some ancient parent; and it was claimed of him, an old maid of a bachelor, that if the striation of the corduroy suits he wore in all weathers looked as raggedly corrugated as it did, it was that he would freshen it simply by plunging it every six months or so into a sinkful of boiling water and detergent. Character is fate, as the saying goes, and yet how to explain the behaviour of a middle-aged British author, a recluse from the crass elements of modern culture, who goes off the rails with his obsessive infatuation with a youthful American heartthrob? One day, circumstances lead to De’Ath walking along an unusual route. He takes shelter in a cinema, and enters the showing for the wrong film. It’s a horrible, cheap third rate teen film called Hotpants College II. He’s about to walk out in disgust when a shot of a young male actor catches his attention, and this is the beginning of Giles De’Ath’s obsession with American heartthrob, Ronnie Bostock. I would rerun these two precious tapes of mine until scarcely a heartbeat was struck that I failed to anticipate the instant before. A film viewed this many times, I discovered, however mediocre may appear its point of departure, must always end by acquiring unto itself a special kind of beauty, the beauty of things that are or have come to seem inevitable. Each negligent and certainly unrehearsed gesture, each fortuitous element have swum unsuspecting into the camera’s ken–a face in the crowd, a fleeting, half-glimpsed landscape, some irrelevant, ‘non-signifying’ message just legible in a drugstore window or on an extra’s teeshirt–would by the umpteenth viewing have been branded into the film’s textures, its grain, its very pores, as though all along it had to be so and no other way, as though it were one of the cinema’s vocations, and perhaps its most elevated vocation, thus to statufy spontaneity, to render the incidental indelible, to hold the random to account. After De’Ath reads some distressing news about Ronnie’s future plans, De’Ath decides to travel to America to meet his idol. …. We follow De’Ath’s mordantly funny journey as he descends into obsessed fandom, slyly buying teen mags and disposing of the unwanted pages far from home. But De’Ath is never a figure of fun, for although he’s obsessed, he only once loses control; his fixation is systematic and directed. The remainder of that same afternoon I spent at the town’s hairdressing salon, where my hair was trimmed and my nails finely manicured by an obsequious little fusspot of a man who, with his own elaborately crimped and wavy locks, was the very image of a barber in a French farce; in the more expensive of its two men’s shops in search of a ‘stylish’ silk tie that might set off to advantage the pale grey, slim-waisted suit I had not yet worn in Chesterfield as it had been bought and laid aside for exactly the present occasion; then in a chic and overwhelmingly fragrant flower shop–located, possibly as the result of someone’s drolly irreverent sense of cause and effect, next door to the gun store-where I purchased a vast bouquet of white ‘long-stemmed’ white roses. I thought I’d be writing a post about whether or not De’Ath benefited from the experience with Ronnie, but the novel is much deeper and darker than that, and I’m still mulling over the last few sentences. There’s a wonderful film made of this book, and that’s what brought me to the novel. In Louise Millar’s thriller, City of Strangers, newlywed Grace Scott returns from a two week honeymoon in Thailand to her new flat in Edinburgh only to find a dead man in her kitchen. The man’s shoes are poorly fitting, he has no socks, and later, according to the autopsy, it’s revealed that the man, who had no ID was starving. The police chalk up the body to a burglar who died accidentally in the process of a break-in, but Grace has a vague dissatisfaction with the verdict which becomes amplified when she finds a scribbled note amongst her wedding presents. With the signed note as a clue, and propelled by the uncomfortable knowledge that her own father died alone, Grace decides to pursue the man’s identity and find his family. What begins as a fairly simple connect-the-dots mission soon spirals out of control as Grace begins to learn two very different versions of the dead man’s life. She travels to London, Amsterdam and Paris with questions that lead her into the violent underbelly of the criminal world. There’s a second story strand back in Edinburgh involving Ewan, Louise’s former journalism classmate and his boss, Sula, at Scots Today. Sula is chasing a story which concerns two bodies found in a pit cave: one man was an Australian hiker, and the other was a drug dealer, and Sula asks : “why would an Australian tourist be buried on top of one of Edinburgh’s finest drug dealers?” Of course these two story strands eventually connect. Ewan and Sula are wonderful characters, and yet they are secondary figures in this tale. Their dynamic and dialogue sizzles and altogether seems much more real than that of Grace and Nicu the hunky prize-winning photographer she meets in Amsterdam. There’s one point when Sula pumps an unwitting PC for information. He’s been guarding a crime scene in the cold, and she wanders up to him with a spare bacon roll. At another time, she borrows a greyhound as a prop to join other dogwalkers. The touches of humour which underscore how far some reporters will go to get a story help balance the darker, sadder aspects of this tale. City of Strangers begins as a crime story but then morphs into a more complex, fleshy thriller. While I chewed up the story involving Ewan and Sula, my two favourite characters in the book, I had a much harder time with Grace, who dumps Mac, her newlywed husband without a word to pursue the photojournalist career she knows she wants. I found myself mulling over other plot scenarios: would it have been better if Grace’s husband Mac didn’t exist at all (but then he becomes integral to the plot later,) or what if Grace and Mac had already had longstanding marriage problems when the novel begins? I’ll land on the latter as Grace as a newlywed just didn’t work for this reader. She was too happy to sail off and ‘find herself’ which smacked much more of an unhappily woman than a newlywed–even one with a long-standing relationship such as Grace had with Mac. Grace is essentially drawn as a woman in the midst of a personal crisis having to choose career over domesticity, but the newlywed tag doesn’t mesh, and every time she ignores Mac’s texts or drops his calls, her actions push that post-honeymoon credibility. 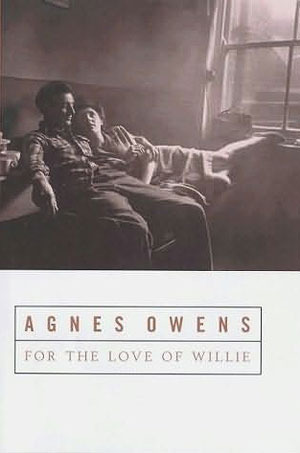 It’s taken me too long to return to Scottish author Agnes Owens, but sorting through book stacks revealed the novella: For the Love of Willie, the tragi-comic story of a young girl’s infatuation with a creepy shop owner named Willie Roper. The story is narrated by now middle-aged Peggy who lives in a mental hospital and whose major relationship is with a much older resident named the Duchess, a woman who may or may not have had a husband. Peggy, stealing paper from wherever she can find it, is determined to write her life story, and equally determined to make the Duchess, who’d much rather obsess on a Mills and Boon romance, read it. So the story goes back and forth with some scenes between Peggy and the Duchess and other scenes that tell Peggy’s story. The big question here, in this story of abdicated responsibility, power and conformity, is what happened to land Peggy in a mental hospital. Peggy’s story begins during WWII, a gloomy world of air raids and rationing, with her first day delivering papers. She’s eager and proud to have landed the job which pays six shillings a week, and pleased that Willie Roper, the shop owner, makes special concessions for her. Plus there are those caramels which she, the only girl delivering papers, gets daily while the boys go without. Life at the newspaper shop is peculiar, and the reclusive Mrs Roper who lives above the shop with her husband rarely appears, although she arranges for sherry deliveries, against her husband’s wishes, courtesy of the paper boys. There are some ugly rumours about Willie but that doesn’t stop Peggy developing a crush on a man more than twice her age, and when she leaves school, she’s employed as his assistant…. While it’s fairly easy to guess where this story is going, it’s the author’s style that makes this story such a delight. Peggy’s powerful voice combined with Agnes Owens’ dark tart humour make this tragicomic tale a marvelous read. At sixteen Peggy is innocent and powerless, or so the adults who surround her think until Peggy’s quirkiness erupts in an unexpected way. In a world in which options are controlled and limited, immature Peggy makes her own tragic decision–the only one she thinks she can live with. Now in middle age, Peggy is in the position, once again, of being controlled by those in power, so we see her shouting through the railings desperately trying to catch the attention of a passing male, locked in the ‘punishment room’ and tranquilized for causing trouble. Even though Peggy is in many ways a victim, somehow she transcends that description, remaining uniquely defiant, obstinately independent, and brutally sane. Her mouth closed firmly as she turned her attention to the film on television. Peggy shook her head and went into a reverie which had nothing to do with her present circumstances. She’s been acting very funny lately. I’m just hoping that it’s her time of life. 16-year-old Peggy is a quirky character, someone who seems uncomplicated until suddenly she shocks us in a way we didn’t anticipate, and that’s exactly what makes this novella so brilliant. We’re left puzzling over the question of Peggy’s sanity, but certainly the adults in Peggy’s life have a great deal of responsibility here. Agnes Owens is an author who will definitely appeal to fans of Beryl Bainbridge. 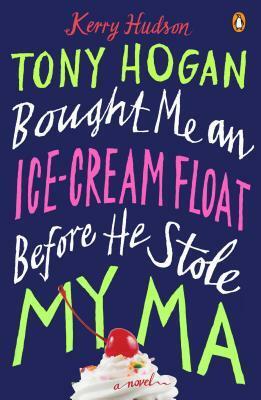 Tony Hogan Bought Me an Ice-Cream Float Before He Stole My Ma is an unwieldy title that is at least memorable in this bittersweet, funny and compelling story of poverty, single motherhood, and a series of bad choices in men. Get beyond a title that does the book no favours and a bumpy first few pages, and you’ll find yourself in a wonderfully, witty, sharp debut novel written by Kerry Hudson. The book begins in the 80s, a little awkwardly, with the birth of Janie, our spunky narrator relating the profanity which accompanied her birth–the result of a brief union with Iris who’d “been tae London and got herself preggers,” and some unnamed American, and while Janie’s birth is celebrated by the Aberdeen Ryan family, the hard realities soon hit. A fight with Iris’s bingo-addicted mother sends Iris onto the streets, and into the Grafton Hilton (“as the guests liked to call it,”) a woman’s shelter full of other bruised and rejected women, and then it’s off to council housing and the gritty slum of Monarch Avenue, a place that Iris initially resists as it’s a bad place for a “bairn.” According to Iris, “I might as well start shooting her up on smack now since that’s what’ll happen,” but Iris doesn’t exactly have a choice. But that’s one of the interesting aspects of the book, when Iris has options, she always chooses badly. But while Monarch Avenue strikes fear into the hearts of those sent to live there, Janie’s reaction, viewed from her shiny new pram, a gift from Iris’s brother, smack addict Uncle Frankie, is of glorious sensation. On the way to buy the moving-in essentials–tea, milk, bread, fags, Jif and a half of vodka–my eyes soaked in our new neighbourhood. Graffiti and scorch marks, echoes of small fires, decorated doorsteps. Golden Special Brew cans and crushed vodka bottles, bright as diamonds, collected in gutters. Front gardens were filled with mouldy paddling pools and, occasionally, a rust burnished shell of a car. I had never seen anything so beautiful, so many colours, before in grey Aberdeen. Tony smothered the life that me and Ma had built, a furry mould growing over a sweating slab of cheese. Although this is Janie’s story, the novel bursts with a colorful cast of secondary characters in this story of a childhood spent growing up amongst heroin addicts, glue sniffers, and alcoholics. While Janie doesn’t exactly have it easy her friends Davey and Leanne whose “parents liked a drink,” envy Janie’s comparatively exotic diet which includes the occasional “Fray Bentos pie and peas or Findus Crispy Pancakes.” Leanne’s ma’s world centres on booze and whatever is left over goes to meals such as chips and beans, or chips and egg. But Leanne’s ma was organized too and on Mondays we would often bump into her in the booze aisle at Safeway with four big sacks of frozen chips thawing in her trolley. There was always a mouth-watering, fatty smell in the air at Leanne’s and at the beginning of the week there would be red sauce too. For the first few days we had tinned spaghetti, fish fingers and pink wafers, but by Sunday the cupboards were bare and we ate a lot of toast and porridge and talked about what we’d buy the next day in the shiny aisles at Safeway. Over toast with a scrape of marge Ma explained she was just getting used to it and she’d find a way to ‘make the grub last’. Frankie always came over on Thursdays. He had to come once a week to collect the little bags of white powder that Ma measured from a bigger bag on scales with numbers like Frankie’s digital watch. Ma did the measuring on Saturday mornings and the little spoons and jumping red numbers always stole my attention, even from Fraggle Rock. “Can I have a go?” My eyes were fixed on the shiny spoons, the soft white powder. Always on the fringes of society, Iris never rises above extreme poverty–sometimes she floats and sometimes, for a brief period, she sinks only to return to the surface in another slum location, and over the years, her fierce tenacity is worn down by degrading disappointment recognized by Janie in one beautifully poignant moment. Author Kerry Hudson paints Janie’s colourful world with bold strokes, and while there’s a moment when Janie discovers a world within books, this is not overworn or clichéd. Given the subject matter, it would have been so easy for this novel to slip off into sentiment, bitterness or loathing, but instead the author shows incredible talent in creating characters whose private lives are mostly sealed from those of us who have some essence of security, and while the characters are treated with empathy, their inability to change, extreme social disadvantages, and zest for self-sabotage is also evident. In spite of adversity, or perhaps because of it, there’s an incredible ‘us-against-the-world’ bond between Janie and Iris and we see this in one incident when Iris is called to task for Janie’s swearing. I laughed and swung our linked hands. The book, essentially a coming-of-age story, follows Janie’s nomadic life until she is 16. Janie initially, of course, doesn’t have any choices, so she follows her mother from seedy bedsit to notorious gritty slum, sometimes escaping with the just bare essentials –whatever she can grab–as Iris never settles down but moves from one tarnished opportunity, usually sparked by either a man’s promises or a man’s violence, to another. Towards the end of the novel, which flounders just a tiny bit, a teenage Janie ends up in Great Yarmouth, and it’s here that she’s able, finally, to make some decisions of her own. The big question, of course, is will history repeat itself or has Janie learned from the mistakes of her mother? This is a remarkable book reminiscent of the early works of Roddy Doyle, and it’s going to end up in my best-of-year list. In an article from The Scotsman, James Robertson explains his interest in and his concerns regarding the Lockerbie case. 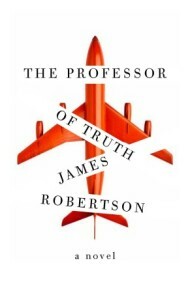 His latest novel, The Professor of Truth, is certain to come in for its share of criticism given its very obvious connections to the explosion of Pan Am flight 103 over Lockerbie in 1988. In 2001, Abdelbaset al-Megrahi was found guilty and sentenced for the bombing. In 2009, diagnosed with prostate cancer, he was allowed to return to Libya, and he died in 2012. Case over? Well no… there are the families of those killed who still have to live with the memories and the loss, and then there are those who are not satisfied with the investigation into the tragedy. One of those not satisfied happens to be James Robertson, and while the words “Lockerbie,” and “Pan Am 103” do not appear anywhere in these pages, their glaring absence only serves to underscore the similarities between the novel and the case surrounding the destruction of Pan Am Flight 103. Robertson will come in for his share of criticism for this novel probably on several levels–for creating a fictional story inspired by a true event and probably also for taking that fiction into a very definite direction. For Robertson’s defense, I’d say that he’s carved an area somewhere between reality and fiction, and that’s a fascinating zone for exploration–especially since the Lockerbie case itself is fraught with some very strange occurrences. But back to the book…. One day, Tealing receives a visitor–a dying American who “had the look of a man who might recently have returned from a long expedition, in the Antarctica perhaps, on which many things had gone wrong.” This man, who calls himself Nilsen, obviously has connections with some American Intelligence agency, is there, he says, “to settle” his debts. “Allegiance?” I could equally well have challenged the word “interested” or the word “assessed,” but they surprised me less. I did not want his respect or his admiration. “That’s a slippery substance, truth,” Nilsen said. The log of the journey. You start an investigation and you’re starting a journey. Sometimes you set off and you draw the map as you go. You’re looking for some end point but you don’t know what or where it is. And other times you do know, and it’s just a matter of how you get there. The narrative is how you get to the right destination. In an attempt to atone for past sins, Nilsen leaves Tealing with a single piece of information. This information may hold the key to the act that ripped apart Alan’s life, and so his obsession leads him to perhaps the final step in his journey towards the truth–a very important word to Tealing. I had begun to think the unthinkable: that I might die before the truth was known about who had killed Emily and Alice. I hadn’t ever doubted that the truth would come out eventually, but if it came out when I was dead what use would it be to me? Or if it came out long after all of us–all the fathers and mothers and sisters and lovers of the dead–were gone? By then it wouldn’t really be the truth at all. It would be information, of historical interest only, provided to people untouched by the event. It would be like news of some atrocity in a foreign, distant land, unreal and therefore, in a way, untrue. They would want to feel it, those people, but they wouldn’t be able to, or the feeling would not be sustainable. Human sympathy can only travel so far. Okay, it’s a bit clunky to jump-start the final leg of Tealing’s search with a Spook smitten with remorse or a desire to pay his moral debts, but the story had to be jump-started somewhere. But apart from that, Robertson shows incredible mastery when creating atmosphere–the tension in Tealing’s house between the two men, the chaos at the site of the plane crash–even as officials swoop in and begin collecting evidence of wreckage, Tealing’s vivid dreams of his dead daughter, and the last lap of Tealing’s journey which takes him to the sweltering heat of a seaside town in Australia, where he plays the role of an incongruous tourist plagued by food poisoning, a scuffle with locals and stuck with a low-rent hotel room. The story goes back in time to the day of the plane crash, moving painfully through Tealing’s discovery that his wife and only child are dead, and then the story takes us back to the present, with occasional glimpses into the past. This is, in a way, a detective story with Tealing, a man of books, desperate to discover the truth about the established/official “narrative” surrounding the explosion. Author Robertson shows terrific empathy and understanding of a life gutted by grief and loss, and also how an average man is spurred on by the desire for the truth, whatever that may be, as a way of finally being able to have some sort of peace. For this reader, The Professor of Truth was a page-turner. Tealing’s grief and sense of living in a state of limbo are palpable, and his sense of urgency, in spite of a 21-year delay, intensely conveyed. This is primarily an excellent novel which explores how ordinary lives become swept up in crimes committed by governments, but at no point does the author dally with preaching any particular political beliefs beyond asking the value of a human life and perhaps underneath it all, exactly who determines why some humans should be worth more than others. James Kelman’s, Mo Said She Was Quirky (and it’s a great title, btw) begins with a young croupier named Helen, riding home in a taxi after working the night shift. As the taxi approaches the traffic light, Helen notices two homeless men about to cross the road. A quiet drama takes place–part of it in Helen’s mind, and completely unnoticed by her two workmates, as Helen speculates whether the men will make it across the road before the lights change. There’s tension in the air. Helen and the taxi driver both feel it as this is a moment when the incident could explode into something ugly. The homeless men move on and moment passes. The incident is significant for Helen. While watching the homeless men, she initially, through interior dialogue, notes the awkwardness of riding in a taxi “with poor people seeing her, as though she was rich, she wasn’t.” But then as she watches the two men, one of them seems familiar, and in a split second, she is convinced that this is her brother, Brian. While the other two women giggle about the condition of the two homeless men and the desire to take their picture, Helen sinks into the knowledge that her brother–she last saw him twelve years ago– now lives on the London streets. The meaningless, cruel chatter of the two workmates fades into background noise as Helen grapples silently with the brief vision of the homeless men. The novel follow’s Helen’s life for the next 24 hours. She returns home and begins searching through old family photos as if she will find answers to unsolved questions. We learn that Helen, originally from Glasgow, now lives with her restaurant worker boyfriend Anglo-Pakistani Mo and her six-year-old daughter. To Helen, Mo is “like normality,” against some pathological family relationships, including Helen’s mother’s general “lack of interest.” Mo and Helen met in Glasgow but moved to London partly to escape her violent, bullying ex. While to Helen, Mo is a sanctuary, there are problems here too. The rest of the novel is approximately 24 hours in Helen’s life told through interior monologue with a stream of consciousness narrative. I am not fond of stream of consciousness. Although I recognize its possibilities and its cleverness, it’s a narrative form that can be hard on the reader. In the case of Mo Said She Was Quirky, the stream of consciousness narrative isn’t particularly hard to follow. Just being alive was a gamble. You opened a door and what was behind? You never knew. Everybody took risks. Helen too, she had done. Never again. Never. never never. Oh my god the thought, the very thought! The one she went with made her shiver. Even thinking about him. It was true. Who made her feel like that? Nobody. Oh how he looked at her, he just had to, even away over, he would be standing away over and she would be dealing and perhaps somebody asking for a card and she happened to see him, just glancing across. Then he was gone; she looked and she didnt see him. She couldnt stop thinking about him, he just arrived and she saw him and then he was away and she couldnt think of anything else. That was so against the rules. You could act ordinary in the job but when it came to men it took away and it took away your concentration, oh no, then their hands were in the till and you were out of a job. Helen is a very ordinary person, and by this I mean she is a single mother, overworked and underpaid, living in poverty in a flat not much bigger than a large dog kennel—it’s so small that Helen’s daughter, Sophie sleeps in a modified cupboard. Knowing Mr Adams let her see about her ex what she didn’t want in life. Him! It didnt affect their relationship because that was already finished. Only she hadnt told him. She knew and he didnt. How many times lying there beside him in the dark and he was awake, and she could have said it to him, she could have. And she knew he was awake. Oh she knew alright because when he swallowed. People dont swallow, not if they are asleep. He was wondering if she was awake. She hardly breathed. She wouldnt have, not for him, never. Her mind could go any place. She was able to lie there and think it, whatever it was, whatever she wanted to think, and he was powerless because he could not stop her brains. He would if he could but he couldnt. Except if he nudged her. Horrible. Stream of consciousness allows access to an unfettered flow of thoughts without inhibition or social constraints. It’s a narrative that is especially rewarding in its unleashing of a rich, inner life. However, in Helen’s case, her inner life is fraught with concerns, worries, bad memories and anxieties. It’s not very exciting, and it becomes almost claustrophobic and wearing at some points. Yet at the same time, there’s an undeniable pull to the sincerity of Helen’s thought processes. Helen emerges as a very real character, the sort of woman you might pass on the street and not notice, and yet Kelman’s tickertape narrative reveals her isolation and the extraordinarily difficult inner life of an average working, single mother. On a final note, all apostrophes for contractions appear to be absent. At first, I thought that this was an issue with my kindle version, but the print copy is the same. It’s a tic I found annoying.